DEBORAH CROMBIE: We have so much fun on Jungle Red--there's always something new and entertaining. Today we have a first ever (I think) for us--an official COVER REVEAL from one of our favorite authors, Mark Pryor. Mark is giving JUNGLE RED the first look anywhere at the cover of his upcoming Hugo Marston novel, THE BOOK ARTIST! I am a huge fan of this series so cannot wait to get my hands on this absolutely gorgeous book! Without further ado, here's Mark to tell us about it! 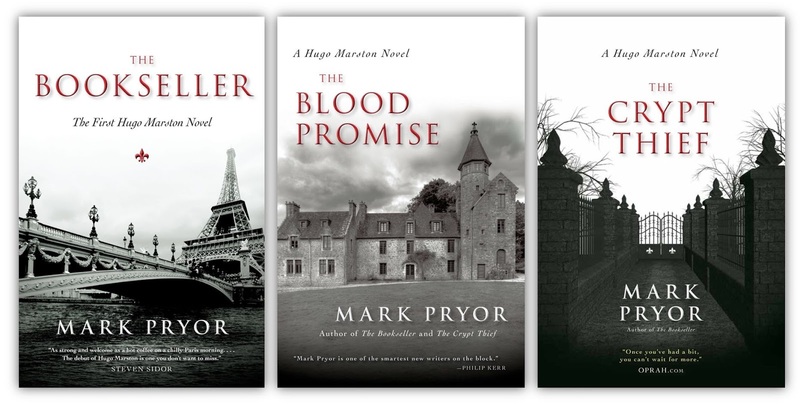 MARK PRYOR: There are many exciting moments in an author's life, and with a book release on the horizon there's much to look forward to. Top of the list is release day itself, and close behind is getting that big box of books from the publisher. Oh, before I get ahead of myself, and since this is the topic of this post, please allow me the honor of sharing the cover for my upcoming mystery novel with you, the next in the Hugo Marston series, and say a big thank you to my friends at JRW for letting me do this exclusive reveal on their wonderful blog! The fantastic artist at Seventh Street Books actually sent me three options, but this one was my immediate favorite. For one thing, all that color just makes it pop off the page. And I think the pinks and yellows tie in well with the title, and the subject matter of an artist. Now, I know many readers of this blog enjoy mystery series, like Debs's Duncan Kincaid / Gemma James novels, and those present publishers with their own challenges. Most notably: how do you keep the covers of a series consistent, but also fresh? Take my first three books, all of which were basically black and white. I loved them all but, as the number of books in the series grew, it became increasingly obvious to me and the good people at Seventh Street that we couldn't stick to black and white forever. 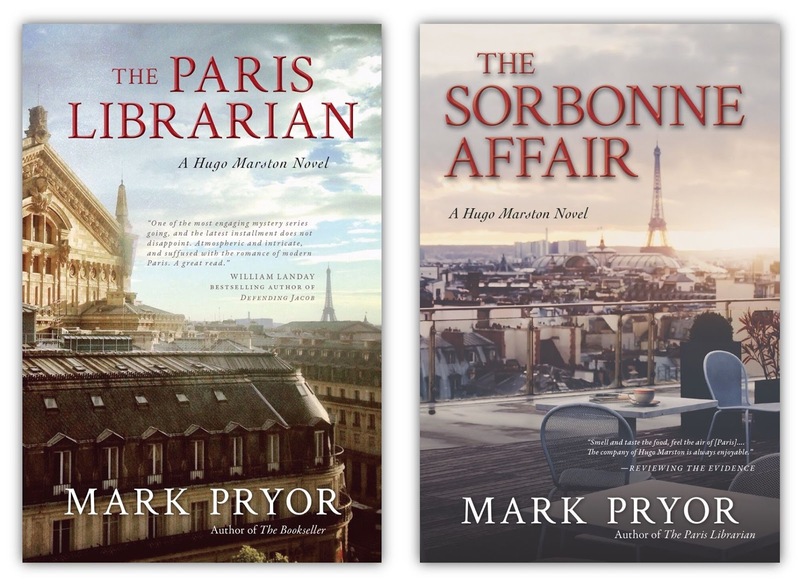 So, while staying with the "obviously Paris" theme, we moved into richer colors with THE PARIS LIBRARIAN and THE SORBONNE AFFAIR. One of the mock-ups for the January release of THE BOOK ARTIST was quite similar to these but, once again, SSB and I went for something slightly different, the more colorful (dare I say braver?!) option. And as I said, I love it. So I'm curious, JRW writers, how important are covers to you, and how much input do you try and give. Likewise for JRW readers, how much attention do you pay to book covers? Are covers more important for stand-alone books than for series books (that you'd likely buy anyway)? 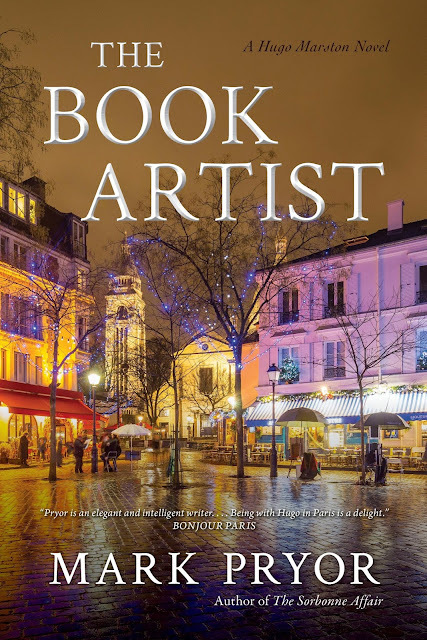 Hugo Marston attends the opening night of an art exhibition in Montmartre, Paris, and is less than happy about going until he finds out that the sculptures on display are made from his favorite medium: books. But soon after the champagne starts to flow and the canapes are served, the night takes a deadly turn when one of the attendees is found murdered. Hugo lingers at the scene and offers his profiling expertise to help solve the crime, but the detective in charge quickly jumps to his own conclusions. He makes an arrest, but it's someone close to Hugo, and someone he's positive is innocent. Meanwhile, his best friend Tom Green has disappeared to Amsterdam, hunting an enemy from their past, an enemy who gets the upper hand on Tom, and who then sets his sights on Hugo. With an innocent behind bars, a murder to solve, and his own life in danger, Hugo knows he has no time to waste as one killer tries to slip away, and another gets closer and closer. DEB: Mark, I can't imagine that you didn't make the right choice. I've liked your covers from the very beginning but this one is absolutely stunning! I would pull this off the rack--or off the Internet--in a heartbeat even if I'd never heard of Hugo, and that's what we all want. READERS, Mark will be stopping in to chat today and I'm sure we have a lot to say about covers. Mark Pryor is a former newspaper reporter from England, and now a prosecutor with the Travis County District Attorney's Office, in Austin, Texas. 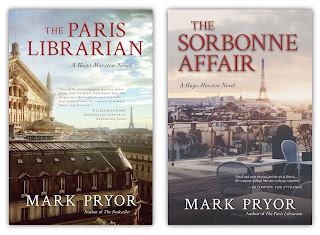 The most recent is THE SORBONNE AFFAIR, a "flawlessly constructed whodunit," according to Booklist. His previous novel in the series was THE PARIS LIBRARIAN, which the Toronto Globe & Mail says “has it all… a finely structured plot that’s one of Pryor’s best books yet.” The first Hugo Marston novel, THE BOOKSELLER, was a Library Journal Debut of the Month, and called "unputdownable" by Oprah.com, and the series has been featured in the New York Times. Mark is also the author of the psychological thriller, HOLLOW MAN, and its sequel, DOMINIC, published in January of 2018. He also created the nationally-recognized true-crime blog 'D.A. Confidential.' As a prosecutor, he has appeared on CBS News's 48 Hours and Discovery Channel's Discovery ID: Cold Blood. JENN McKINLAY: If you know anything about me at all, by my almost two year tour of duty on Jungle Red Writers, you know that I love to laugh. 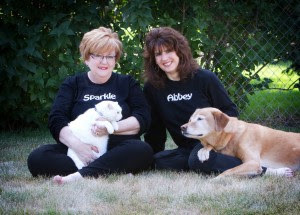 Well, here is Sparkle Abbey, a duo of writers, who make me laugh every time I see them (usually in line at Starbucks when at a conference) or when I read their work. Seriously, these gals crack me up so now I share them with you! SPARKLE ABBEY: First, thank you so much for inviting us, Jenn. We’re excited to be here! Since we’re new on JRW, we thought we’d start off with a few Sparkle Abbey fun facts. · We are friends as well as neighbors. We live just one street away from each other. We can see each other’s houses from our windows. · We’re both grandmothers and are crazy about our grandchildren. · We both enjoy old movies, especially, the vintage romantic comedies. · We have taken yoga classes together, although Anita (“Abbey”) has been known to fall asleep during the relaxation portion. · We love to travel together and usually navigate pretty well. Although once, we did accidently go to Michigan. · We love to plot on road trips. · Our favorite drink is a margarita on the rocks or an iced tea. Unfortunately, there have been fewer margaritas as we’ve made a conscience effort to improve our eating habits. Now we drink soda water and Grey Goose with a twist of lime. Or iced tea. · We enjoy writing about relationships – relationships between humans and their pets, mothers and daughters, and best friends. We also like writing about murder. 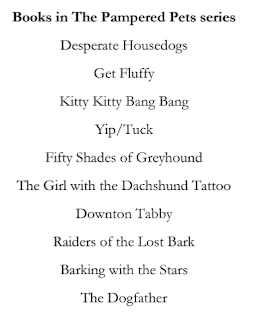 · We love to brainstorm fun, over the top titles. For us, nine out of ten times, the title comes first. 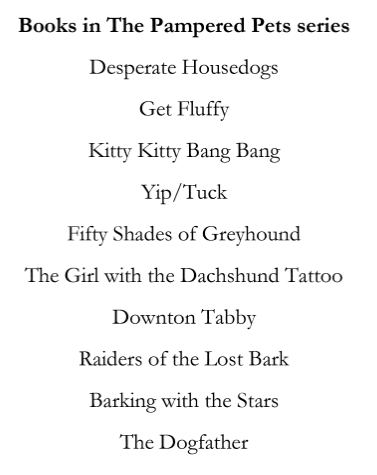 We spend a lot of time brainstorming titles that evoke a sense of humor and lightness that will also correlate with a pet themed series. We enjoy the process, and have been known to drink a couple of margaritas while we pitch ideas. We have pages and pages of possibilities. Some cheesy, some decent, and some that are real “howl” worthy. We’ve been fortunate to keep all our original titles except for book seven. The original title was Kitty Confidential. The book was about half written when our editor decided she want something “bigger.” Um, sure. We reviewed our list of options, but didn’t like a single idea. We were finding it difficult to come up with a new title for a story that was already in progress. Honestly, there are only so many good cat themed ideas. Eventually, everyone all agreed on Downton Tabby. All we had to do to make it work was to add a tabby to the story. No problem. We’re back to brainstorming new titles. We’d love to hear your suggestions. Here are a few titles that more than one person has shared with us to get you in the mood. 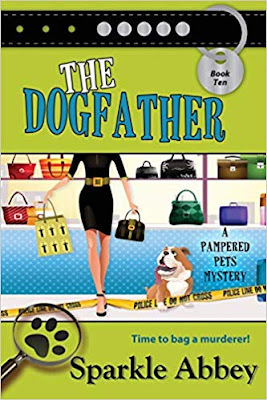 One lucky commenter will win a signed copy of book 10, The Dogfather, will make its debut September 21st. What about you, Reds? What comes first, the title or the plot? Readers, will a title get you to buy a book or not? Launch day today! What to do, how to help, what to say? What to wear to Brookline Booksmith tonight. It is ONE THOUSAND DEGREES in Boston, gang. Thank goodness for air conditioning. And besides the chaos of launch day, I’m writing my new book, and the deadline, is of course, today. La dee dah, and I am counting blessings that I am lucky enough to do that. I wrote an article for CrimeReads about my Top Ten true crime narrative nonfiction books written by reporters. (Talk about a niche article!) Like In Cold Blood, and Midnight in the Garden of Good and Evil, and Zodiac, and Blood and Money. And more. And that’ll be published soon! The reason for that particular article? 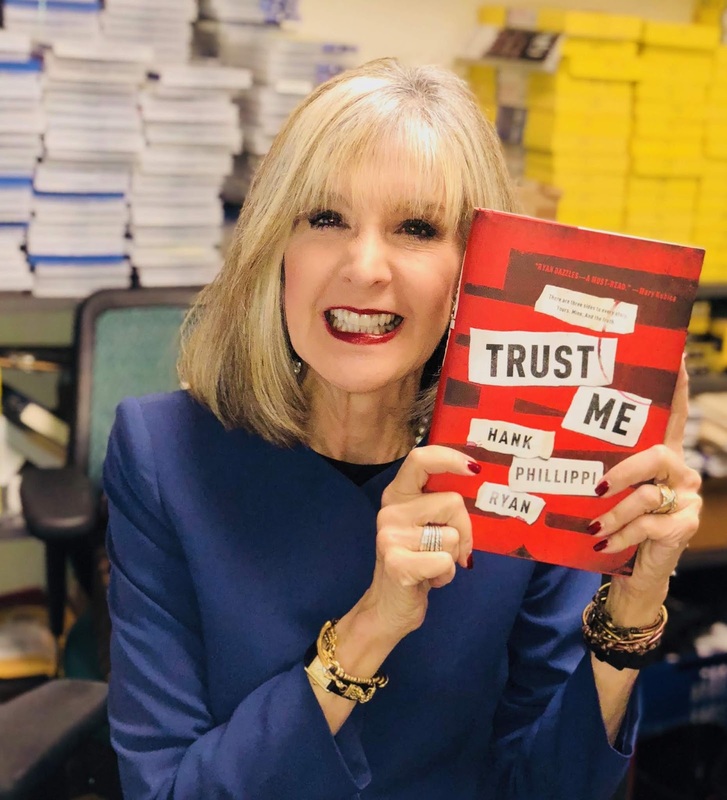 In TRUST ME, main character Mercer is writing the true crime book about a terrible murder, and she realizes it’s difficult to do… How can you write a true crime novel if you don’t know the truth? I wrote an upcoming article for Criminal Element about my top ten reporter movies. Because sometimes the best stories are not girl gets boy, but girl gets story. Broadcast News. All the President’s Men. His Girl Friday. The Big Clock. Spotlight. Why that article? 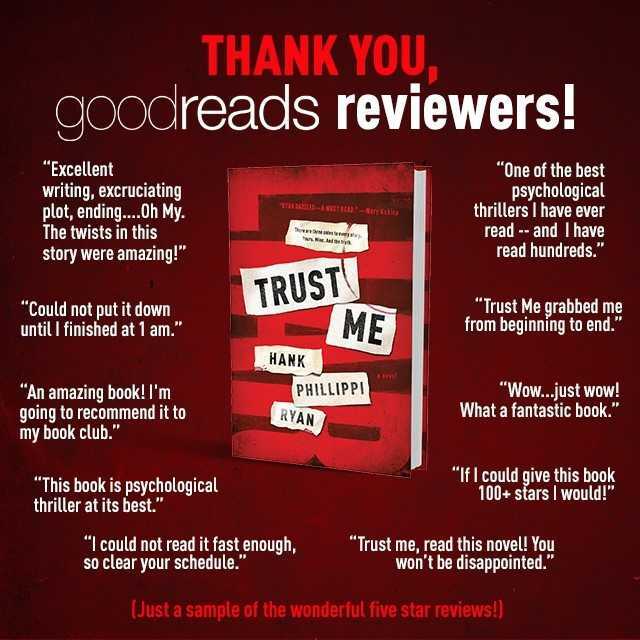 The main character in Trust Me gives up a burgeoning career as a magazine reporter to stay home with her husband and young daughter…only to have them killed in a tragic accident. (Or was it?) 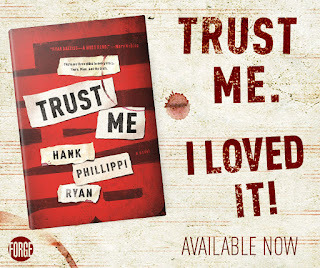 That intense hunt for tracking down the truth is also the core of Trust Me. Who can you trust if you can’t trust yourself? And how can you write the true story of someone else’s life—if you can’t write your own life? Lisa Gardner and I did a chat about psychological suspense—she interviewed me, can you believe it? And that will be out soon. I did a piece for Mystery Scene Magazine with Shari Lapena, B.A. Paris, Lisa Gardner and Mary Kubica about the challenges of writing psychological suspense. And that’ll be out soon! My wonderful publisher, Forge, asked me to write an essay on the origin story of Trust Me for their blog. And that is so fascinating! 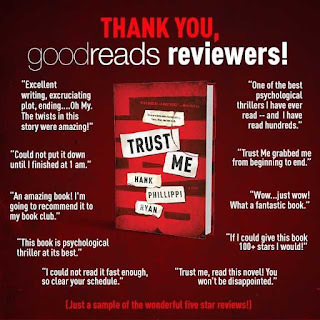 You can read it here, https://www.torforgeblog.com/2018/08/09/three-sides-to-every-story/ but the very short version: Trust Me comes from two huge criminal trials that I was intimately involved in…and what happened during and after them. And the story I –somehow—created that’s a mix and meld and pursuit and rethinking of both of them and more. There are three sides to every story, I learned. Yours, mine, and the truth. Reds and readers, I am keeping the floor here, one more second, to thank you. We are together every single day. We’ve been here together for more than ten years, can you believe it? This is a big big day for me, and I am incredibly honored to share it with you. 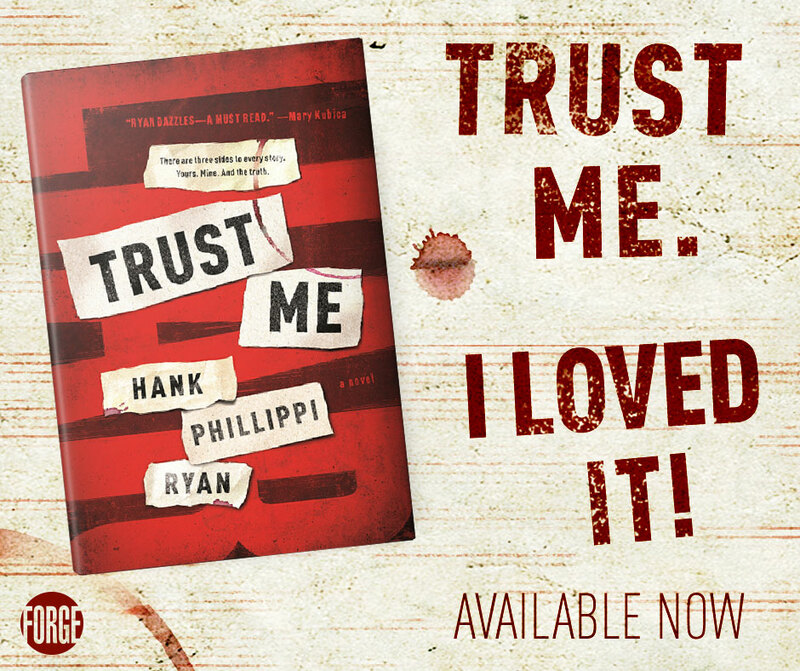 And I—let’s be honest here—want you to buy Trust Me.